Mesquite Valley Woodcrafts is your one stop shop for all your gifts and fine home furnishings. Place your order today! Your one-stop solution for handcrafted Wood Lazy Susans, and custom wood products. 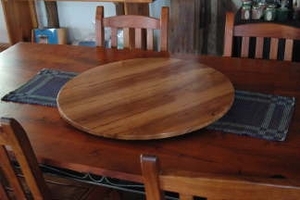 Browse our complete selection of wood tabletop Lazy Susan Turntables that fit any decor style in a variety of natural wood species and colors. We individually handcraft all of our wood products in-house to exceed your expectations. Custom orders accepted every day! Welcome to MVW Online Store!